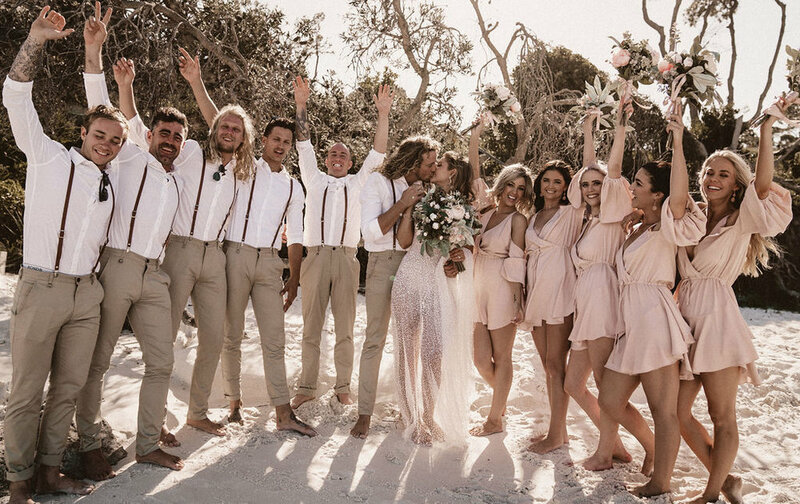 Brookelyn And Chris’ Wedding Was Defined By Adventure. Their Day Reflected A Life Rich With Joy And Experience, in An Undeniable Sequence Of All That They Love. 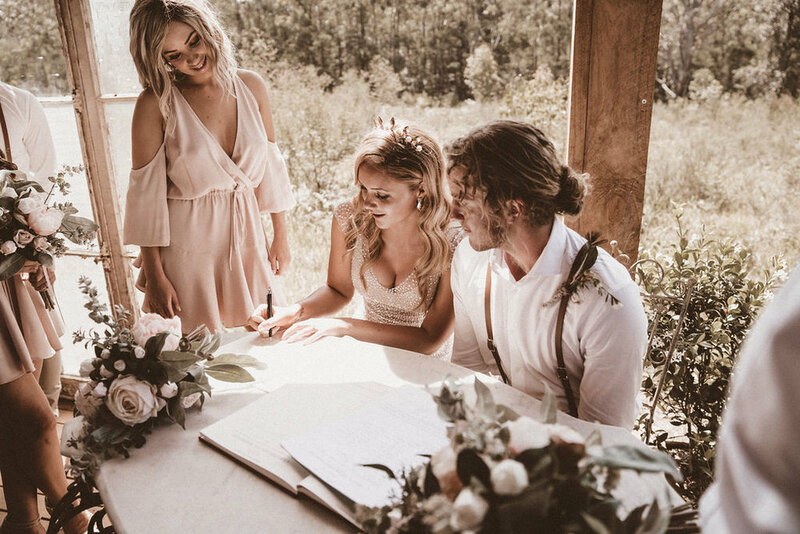 Wed Amongst The Woods Of Jarvis Bay, The Festival Style Celebration Welcomed A Calm Sense Of Serenity in A Day Brimming With Emotion. How we met… We were matched together by a mutual friend playing cupid. I had finished working on a site in WA and had moved to Sydney. Two months later a former colleague contacted me to let me know he had just met the male version of me! He sent me his Instagram details and told me to contact him. I refused. This friend was also insisting Chris get in contact with me. Eventually we became social media friends, who began talking…every day! Our Engagement Story… The proposal was at sunrise at a lookout in Coffs Harbour on Good Friday, followed by a weekend of romantic activities which included watching Tash Sultana in Sydney. Finding the ‘ONE’… Finding my Anna Campbell dress is actually a story of fate! 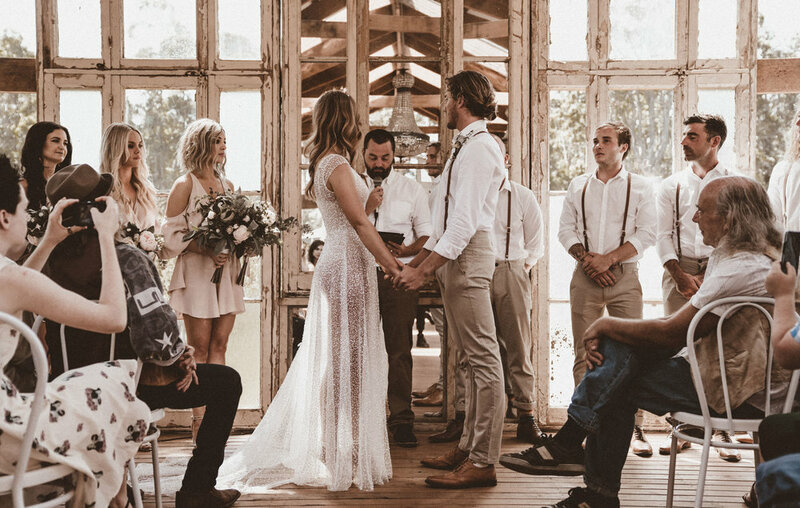 I had created a ‘Wedding Dress Inspo’ album on Pinterest and I had pinned a photograph of the ‘Sydney Dress’ but didn’t know who the designer was and hadn’t looked into it further. A few months later my Aunty and I decided to meet in Melbourne for my birthday, I thought it would be the perfect time to look at wedding dresses. So I brought up Google, and typed in ‘Melbourne Wedding Dress’ and I scrolled through judging the shops by their names, then there was Anna Campbell as soon as I read ‘bohemian bridal’ I opened the site. Scrolling through the design gallery I found the dress from my Pinterest album! I booked my appointment right then and there for the Armadale boutique. Anna Campbell was the only wedding dress designer I booked an appointment with. When you know, you know… I tried the Sydney dress on first and fell in love instantly with how it made me feel. I can honestly say I haven’t ever tried on an item of clothing and loved it right away, we always have that voice in the back of our head “It will look good once I’m tanned, have my hair done, have more makeup on etc..” But when Bernadette fitted me into the dress I felt WOW! I didn’t want to take it off, I felt like The Little Mermaid in the scene when she walks out of the ocean towards her prince in a sparkling dress of sea foam. That’s how I knew it was the ONE; it made me feel like a Princess. Wearing my dress… I felt FREE and empowered and completely feminine. I didn’t feel constricted, I could move, I could dance and I loved that rather than being hidden behind layers of material, the dress made me shine! Favourite element of the Sydney dress… I loved that it was sheer; it was so daring in the most romantic way. There were certainly people that had reservations about the fact I would be wearing such a sheer dress. And I adored the way it sparkled, all over! Pearls of wisdom for future Anna Campbell Brides… Do not let anyone hijack your day or try to sway your decisions with their opinions or expectations. If I had listened to other people I wouldn’t have worn my dream dress. Stationary: The Instant Printable Shop | PepperPrint Coffs Harbour, NSW.